This essay is based on the attached policy brief. 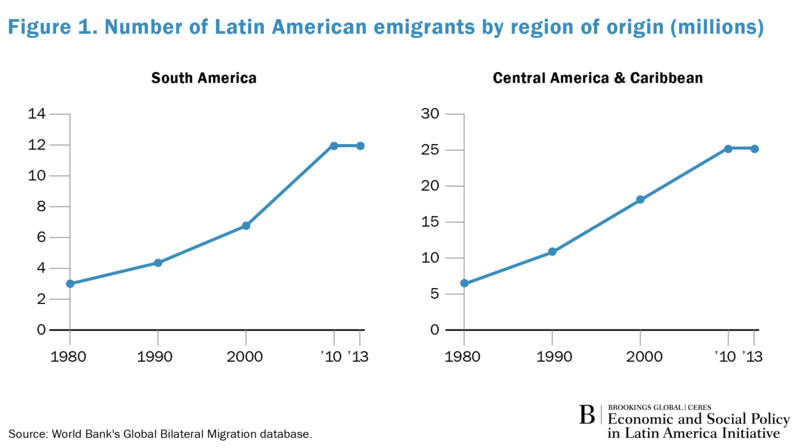 As of today, close to 40 million Latin Americans have migrated out of their country of origin, up from less than 10 million in the early 1980s (see Figure 1). These emigrants represent about 15 percent of all migrants around the globe, which is twice as much as the Latin American share of the world’s population. This rising—and possibly irreversible—trend raises the question: Can growing diasporas—people living outside the country they were born in—represent an economic opportunity for Latin America? 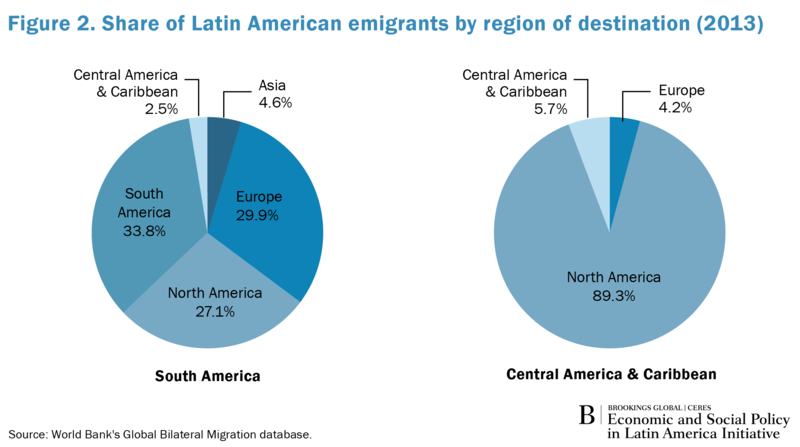 Migrants and diaspora groups are, to some extent, “unexploited capital.” As Figure 2 shows, the majority of emigrants from Latin America live in the developed world: While the Central American diaspora is mostly concentrated in the United States, more than half of South American migrants are spread throughout both the U.S. and Europe. This bridge to wealthy Western countries presents enormous economic growth and development opportunities for Latin America. There are three main ways in which Latin American diasporas can support the development of their home countries: remittances, business networks, and the diffusion of knowledge and technology. In this essay, we focus on the latter. Economists have long been fascinated by the geographically localized nature of knowledge (for example, the tendency of scientists and inventors to cite more often the work of other scientists and inventors located nearby, or the way firms benefit from the innovation happening in other firms located nearby). Why is proximity so important for knowledge to be passed along? A widely accepted answer is that human interaction is key—that is, knowledge is as mobile as people are. If human interaction is critical for the transmission of knowledge and technologies, then migrants can play a crucial role as carriers of knowledge across borders. In fact, both anecdotal and scientific evidence support this idea. Take, for example, South Africa’s wine industry, which exports all over the world. Many of the country’s most renowned wineries are in Franschoek Valley, about 30 miles from Cape Town and founded in the late 17th century by French Huguenot refugees who were expelled by King Louis XIV. These migrants brought with them production and merchandising expertise, and developed highly sought after varieties of South African wine. More generally, evidence shows that migration plays a role in improving industry-level productivity for both sending and receiving countries of migrants. In fact, countries are more likely to become exporters of goods typical of their immigrants’ sending countries and their emigrants’ receiving countries. Given that knowledge diffusion requires human interaction, engaging diasporas in programs to improve competitiveness and productivity could yield significant economic benefits. For instance, a firm could benefit from having its workers temporarily train abroad to learn new technologies or gain knowledge that could result in higher productivity upon their return. Multinational firms often offer these programs to their employees, allowing them to relocate to a foreign branch for some time. Yet this is beyond the reach of small and medium firms. First, they simply do not have foreign branches that can host their workers. More importantly, they cannot afford to train workers in this way. Even if small and medium-sized firms did pay for such overseas training, they would risk losing returning employees to other firms. In equilibrium, this results in an underinvestment in workers training. Public policy could address these difficulties for small and medium-sized firms. First, after coordinating with diaspora organizations, foreign firms in similar industries owned by members of the diaspora could host employees for temporary overseas training. A bilateral agreement would handle permits and visas for these workers. Second, given that the binding constraint is underinvestment and that training workers abroad entails a social gain, it would be justifiable for the home government to partially or fully subsidize those experiences. In this sense, the government would be absorbing part of, if not all, the risk of the worker not returning to her original workplace, since society as a whole benefits from the investment regardless. The “right” amount of subsidy should therefore be calibrated to each firm’s circumstance. The subsidy would have to be large enough to reduce or eliminate private risk but not so large that it crowds out private investment (that is, the subsidy should not replace or drive down firms’ own spending on overseas training programs). Another way to promote temporary migration would be to offer workers conditional loans to fund their overseas training (firms, of course, would have to agree). These loans would only need to be repaid by workers who do not return to their home countries after the training period (similar to the model used for scholarships to study abroad). Alternatively, governments can enhance the transmission of knowledge process by encouraging members of its diaspora to return home, which could translate into faster productivity growth. This productivity boost can be attributed to three stylized facts. First, migrants are disproportionally more likely to become entrepreneurs, so return migration can increase business dynamism and productivity growth. Second, migrants bring knowledge (e.g., technologies, management styles, understanding of other markets, etc.) that can boost innovation and productivity at the firm level to already existing firms. Third, return migrants create and foster business relationships with firms in the countries where they lived. An important policy instrument could be for sending countries to offer fiscal incentives to encourage return migration. For example, the marginal income tax rate could be reduced for a number of years upon return, conditional on employment and/or investment. The incentive structure could be designed such that all migrants benefit regardless of their occupation or skillset or, alternatively, the benefits could be targeted to migrants with experience in and knowledge of industries in which the country has an unrealized advantage. Identifying those industries, however, can be very difficult if not impossible—and letting governments choose at will is a sure recipe for cronyism. Despite the significant potential of diasporas to foster economic development in their home countries, developing nations with large emigrant populations have not typically prioritized policies that aim to benefit from them. Deliberately tapping into diasporas’ unexploited capital could play an important role in reversing the worrying and well-documented slowdown in productivity ailing both advanced and emerging markets, including Latin America.